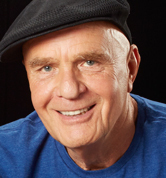 Editor’s Note: We are all deeply saddened by the passing of Dr.Wayne Dyer on August 30th, 2015. Below is an excerpt from Wayne’s most recent book, Memories of Heaven, which illustrates perfectly his belief in far more than just this earthly experience. I have enjoyed a lifetime love affair with children, particularly newborns, infants, and toddlers. If a baby is in the room, it’s almost as if there is a magnetic connection that draws my attention and I must make contact. Being the father of eight children, I have spent countless hours simply gazing into the eyes of a brand-new arrival into our family. In these private moments, I often send silent inquisitive messages asking them to tell me about God and what the formless spiritual world is like. I have passed many, many hours of my life lying on the floor making direct contact with our new arrivals. I’ve long been fascinated by the fact that children just show up here with personality traits. I love to ask little toddlers who are only beginning to communicate with language to tell me what they remember.